This is a simple, light and creamy dessert recipe that is a great one to have in your back pocket. The flavors are subtle, elegant and sure to impress dinner guests, yet it is easy to prepare. Since it requires several hours of refrigeration time prior to serving, it makes it a great prep-ahead option for gatherings. Make it a day or two ahead and be ready to go! Makes 4 individual servings in ramekins; or choose demi cups, glasses or even a small Bundt pan. Chill panna cotta in ramekins; unmold on to serving plate garnished with a brush of coulis and sprinkling of berries and/or lavender buds — OR — serve in the ramekins with a drizzle of coulis and sprinkling of berries on top. Pour panna cotta into martini, other special glasses or dishes; chill and serve without unmolding, with a drizzle of coulis and garnish on top. Make one larger mold in a small Bundt pan; unmold, slice and serve with drizzles of coulis and desired garnish. In a medium-sized saucepan, place the cream, honey, cardamom, and lavender flowers. Bring the mixture to a simmer, stirring to dissolve the honey, 30 – 60 seconds. Remove from heat, cover the pan and steep for 10 – 15 minutes. In the meantime, prepare the ramekins by very lightly spraying with cooking spray and wiping out any excess. Place the cold water into a small prep bowl. Sprinkle the gelatin over the cold water and let stand for at least 5 to 10 minutes. Add the gelatin mixture to the warm cream and stir until completely dissolved and smooth. Divide the mixture evenly between the prepared ramekins and allow to cool slightly. Cover with plastic wrap and refrigerate for at least 4 hours, and up to 2 days. When ready to serve, run a sharp knife or flexible rubber spatula around the edge of each panna cotta and unmold onto a serving plate. 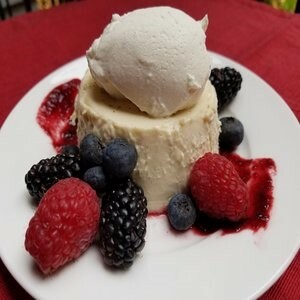 Brush the coulis on to the serving plate or spoon or drizzle a small amount of the Lavender Berry Coulis around the panna cotta and garnish with the fresh berries and/or lavender flowers, as desired. Mixing darker berries (blackberries and blueberries) with brighter berries (raspberries and strawberries) adds depth of flavor to this wonderful coulis. Use it with anything you wish to add a touch of berry goodness! Place berries in a blender and blend until smooth. Strain and press the berry juice through a fine sieve or strainer into a small saucepan, and discard the remaining solids. Add the granulated sugar, balsamic vinegar, and lavender to the berry juice; stir to combine. Bring mixture to a boil over medium-high heat; reduce heat and simmer uncovered for approximately 5 – 8 minutes, until beginning to thicken. Remove from heat. Strain mixture into a small container to remove lavender buds. Cool completely, cover and refrigerated until ready to use, up to 5 days.